Jan. 27, 2017, 10:39 a.m.
By Laura Hazard Owen @laurahazardowen Jan. 27, 2017, 10:39 a.m. The Trump administration, in its first full week in office, moved to restrict how a number of federal agencies communicate with the public, including the media. And while at least some of those restrictions appear to have been loosened, the new administration’s stance on the press is quite clear. “The media here is the opposition party,” chief White House strategist and longtime New York Times reader Steve Bannon said Thursday, adding that the press should “keep its mouth shut” for a while. The week’s events and the new climate of uncertainty spurred a number of news organizations to remind readers that they are ready and willing to accept leaks, via regular mail and also online with secure tools like SecureDrop, the encrypted anonymous communication software maintained by the Freedom of the Press Foundation. 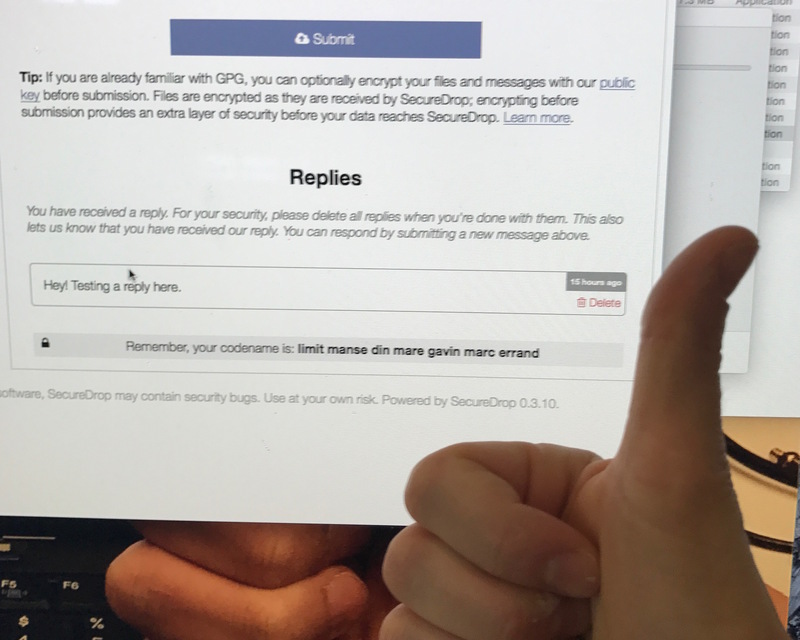 I wanted to see just how easy it actually was to use SecureDrop, which I’d never done before. 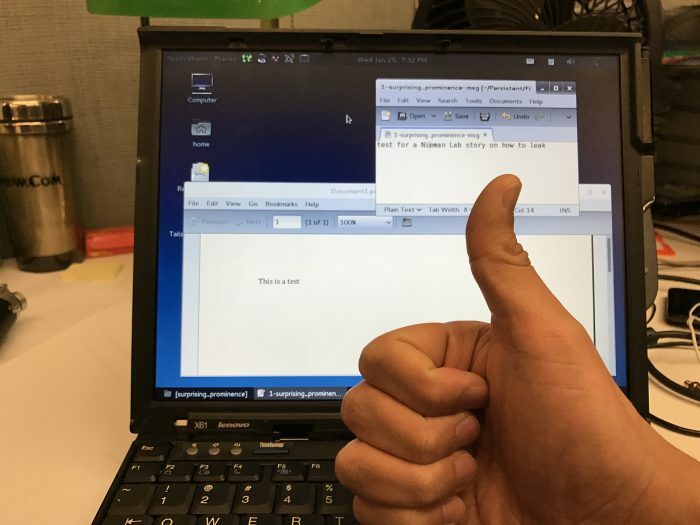 I enlisted ProPublica’s help: I told them I’d be sending them a document (a single-page PDF with “This is a test” on it), and asked them to confirm that they received it. This is not what you do if you are actually leaking something and want to remain anonymous, duh, but I was interested to see what things look like on the other side. The full instructions for sources to use SecureDrop are on the SecureDrop website, but essentially, this is what I did — and what you need to do. 1. Download the Tor browser here. Install it just as you would install any app on your computer. 2. Open Tor. It’s like using any Internet browser. I was mainly surprised by how slow it is — but that’s a feature, not a bug: “Tor is never going to be blazing fast. Your traffic is bouncing through volunteers’ computers in various parts of the world, and some bottlenecks and network latency will always be present,” Tor explains on its site. 3. Paste the SecureDrop address of the news organization you want to reach (all of these are listed below, ending in .onion) in Tor’s address bar. You’ll see the option to send a document or check the status of one you’ve already sent. 5. Select the file that you want to upload from your computer, or type a message. 6. You can check back for replies to your message by redirecting the Tor browser to the news org’s SecureDrop address and then typing in the secret codename that you wrote down. I logged back in, using the seven-word codename I’d been assigned in step 4, and saw my response from ProPublica. That’s it. It was way easier than I thought it would be. Leakers shouldn’t use their work computers and should use public wifi, “like a Starbucks or at a hotel or anywhere where the Internet is open for public use.” And, of course, just using Tor and SecureDrop isn’t a perfect solution for security: If you were doing this from one of your employer’s computers, it might be able to notice that the Tor network was accessed, even if it couldn’t see the contents of whatever you sent. Use as much caution and good sense as you can about distancing yourself from equipment and network locations you might be connected to. You may also want to watch this video, from Canada’s Globe and Mail, for a visual representation of the above steps. POSTED Jan. 27, 2017, 10:39 a.m.
Owen, Laura Hazard. "How easy is it to securely leak information to some of America’s top news organizations? This easy." Nieman Journalism Lab. Nieman Foundation for Journalism at Harvard, 27 Jan. 2017. Web. 23 Apr. 2019. Owen, Laura Hazard. "How easy is it to securely leak information to some of America’s top news organizations? This easy." Nieman Journalism Lab. Last modified January 27, 2017. Accessed April 23, 2019. https://www.niemanlab.org/2017/01/how-easy-is-it-to-securely-leak-information-to-some-of-americas-top-news-organizations-this-easy/.